As I look through the heaps and heaps of drawings made by witnesses to UFO incidents that I’ve gathered on my computer, everything is pretty much the same. 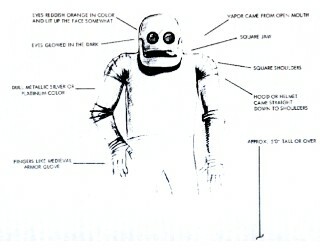 Drawings from the early days of the alien abduction phenomenon either look like normal human beings, or short, bullet-shaped monsters with beady eyes. As time progresses, the aliens get thinner, their necks longer, and their eyes and heads larger until they’re the quintessential little gray men we were all so frightened of for the first few seasons of The X-Files. Yet, every once in a while, one of the pictures doesn’t fit the mold. For instance, the Pascagoula creatures, which supposedly abducted two men while they were fishing in Mississippi. The drawings of them resemble mitten-wearing, elephant-skinned snowmen with carrot ears. However, since I wrote about that case some years ago, today I’m going to write about the next odd-looking alien drawing I happened to come across: The Cisco Grove Robot. September 4, 1964 was apparently a more primitive time in California than I’d imagined. Donald Schrum, then 28, was out hunting with some of his friends, armed with bows and arrows. He became separated from his group and as night fell, he for some reason decided to climb a tree to sleep. Maybe that’s a normal thing hunters do, I don’t know. Anyway, after a while in his leafy new habitat, he saw lights in the sky. Some versions say three, while others say just one. However many there really were, Schrum suspected that they were helicopters that had been sent to locate and rescue him. So he hopped down from the tree and lit some signal fires to attract the pilot’s attention. Little did he know he would be attracting the attention… of terror! The light stopped a few dozen yards away and, after hearing a rustling in the brush, Schrum wisely decided to retreat upwards, back into the comforting branches of tree in which he had planned to sleep. Moments passed which Schrum most likely spent trying to figure out what the strange, hovering light really was. Then, three shapes emerged from the darkness below. The first two looked like normal people, except that they wore tight-fitting, military-style uniforms of a shiny silver material. The appearance of the third creature is where the turn for the bizarre is really taken: it was a robot. And when I say robot, I mean robot in the most old fashioned sense: it looks sort of like the robot maid from The Jetsons. Metal arms and legs, a hinged jaw, and glowing orange eyes that look like lightbulbs screwed into it’s face. Schrum didn’t have time, however, to wonder about the ridiculous creature below him: he became immediately engaged in a night-long struggle. The creatures on the ground began shaking the tree, apparently trying to dislodge Schrum and capture him. A rather resourceful lad, he began lighting pieces of his clothes on fire and dropping them, hoping to scare the creatures off. Nonplussed, they decided to break out the big guns: the robot creature opened it’s hinged jaw and let out a cloud of white vapour, which drifted up the tree and made Schrum nauseous. He passed out, feeling rather ill. When he came to, the two men were climbing up the tree, apparently intent on capturing him, which means that their knock-out gas was effective for, at most, a few minutes. Schrum shook the tree until his erstwhile attackers were forced to retreat. This is how the story went for most of the following 11 hours. At one point, Schrum had the good judgment to begin firing some arrows at the creatures. When one struck the robot, there was an “arc of sparks” and the monster was “knocked back.” If he hit either of the shiny-suited men, there’s no mention of it that I can find. Either way, the arrows were certainly not a deterrent. Shortly before dawn, the things played their trick with the noxious gas again, except that this time when he awoke, Schrum was tied by his belt to a tree branch and his tormentors were gone. Afterwards, people have come out of the woodwork with reasons that this incident really occurred. After rejoining his hunting group the next day, one of his fellow hunters mentioned that he had also seen lights in the sky. Schrum, apparently, worked at a local plant that produced missiles for the government, which to the mind of the UFO enthusiast apparently makes him a ripe target for extra-terrestrial harassment. Most of the reports of this incident also try and make it look ominous that “the government” was apparently already “on site” looking for a meteorite, or something. Sounds like proof of a conspiracy to me! There are a couple of strange things about this case. The first is that no two reports seem to contain the same story, but I’m willing to credit that to the nature of the internet, which destroys all it touches. For instance, some reports claim that the UFO flew above Scrum’s tree during the night and was the source of the white vapour, though most credit the robot-monster as first bringing this weapon to bear. The main thing that makes me wonder about this story, though, is that it bears so little resemblance to other tales of alien hijinks. Robots are reported infrequently, and it doesn’t seem as if the robots from any given story ever resemble the robots from any other story. They’re always unique, and extremely bizarre. Case in point: the insane elephant snowmen from the previously mentioned Pascagoula case. Another thing is the way that the aliens are reported to have acted. Think about this for a moment: They could conquer the non-trivial challenge of interstellar travel, but they can’t get a guy out of a tree? That’s ridiculous. That’s like Andre the Giant not being able to open a jar of pickles. One way or another, those pickles are coming out of there. Either these aliens were the absolute stupidest, most bumbling, least competent abductors ever to grace the good green earth, or they had a reason for leaving the terrified man up that tree. Their actions do, to some extent, appear similar to the actions of the Hopkinsville Goblins or the tiny, wrinkled little men that scared the hell out of some drunkards in Ririe, Idaho in the sixties: the aliens don’t seem to really want anything other than to scare the hell out of some people. The UFO enthusiasts claim that sometimes, aliens just like to screw around with people they abduct, apparently to gauge their reactions. For instance, sometimes they’ll show abductees apocalyptic images of the world being destroyed, just to see how the human will react. Could this just be some evil, alien psychology experiment? The paranormal enthusiast in general, however, will claim that these are not really space aliens at all, no matter how much they may look like space robots, but are in fact demons or psychic manifestations that want to terrify people, because they feed on fear. If true, these monsters must have thought they were at the buffet of a lifetime. The fact of the matter is this: no one knows what happened that night, and no one will ever know. The grand sum of the evidence before us comes from the word of one person, who was alone when the incident happened. There is no physical evidence in any way shape or form, even the dubious sort that UFO enthusiasts routinely uncover, such as indentations in soil or tales of startled livestock or whatever. If you’re willing to take a stranger’s word that beings from another world traveled all this way just to mess around with our heads for some reason, fine. Personally, I don’t trust single witnesses without corroborating evidence, ever. Mental breakdown, bad trip, bear attack, elaborate prank, fabricated tale to spice up a dull night, attempt to impress a girl with a tale of heroism, hell, any of these things are a lot more likely than ‘attempted spacenapping.’ Every explanation, including those involving space men, has the same amount of credible evidence: none.